Last modified on February 24th, 2017 by Vincy. PHP provides simplexml_load_file() function for reading data from XML file. We have seen about this function in Simple XML Parser tutorial. Using this function, we are going to read RSS feeds by passing the feed URL to this function. In this tutorial, we are parsing RSS feed and splitting it into an object array. By iterating this object array, we are getting required property of each feed item to display. This shortcode is used to parse XML feed URL to read data item and display. 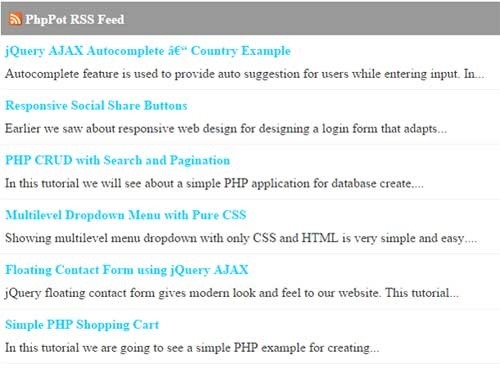 This HTML table will display list of RSS feed items by iterating item array. "Subcontracted work was completed on time, as requested, with great attention to details and utmost flexibility despite various changes towards the end of the project. Bravo! ..."